This day belongs to Jana. "This is my 21st birthday and I'm in New York for it for the first time, so it's a special day for me! Thank you so much for putting a great meaning in a simple dress! Keep inspiring!" 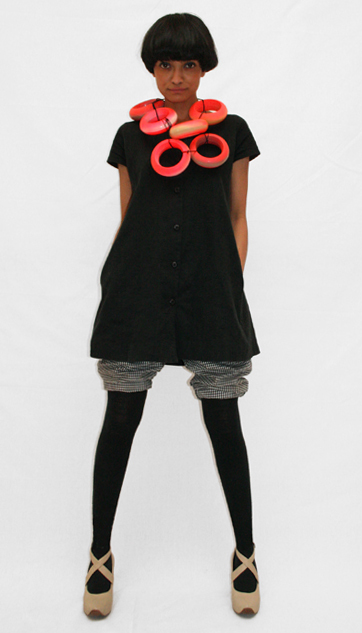 Neckwear designed and donated by one of the leading scandinavian fashion designers at the moment, Maxjenny Forslund. See more info at maxjenny.com. Pants donated by Sosuke rolled up into bloomers, shoes donated by Tara St. James. Sorry about the late post darlings, busy working up some exciting things for you. Nice going on the comments front yesterday by the way. We're bringing COTD back for the finale. So go to town, get it all out, you have 10 days left. Wow it looks like you have lifesaver bouys around your necks! but of course it totally work. It must be fun trying to move around it that necklace, at least you stand out easily! I'm not really a fan of the neckwear, but the rest of it is cute! i bet a year ago you didn't think this dress would cause a controversy! hey, if nothing else it shows that all of your supporters have got your message of change loud and clear - and now we're standing behind you and shouting it out too. ROTFL! This is brrrilliant! I don't know why, exactly; I just love it. The neckwear looks a bit annoying to wear all day but hey, at least it's still original! I love how the UP followers have become so passionate - past generations may have created a world of excessive consumerism but instead of passing blame we need to change our own behaviour and influence the behaviour of others. And whether you would spend $180 on a dress or not, you have to agree that UP has influenced many people to think about fashion in a new way. Maybe you can loan that necklace to some of those stranded travelers to float home!! Payal tagged this Hot on many levels! Few months ago, I would have found 365 reasons as to why I can't try that look. The mad neckwear, the grey pants & beige shoes (drool, btw). But I'm proud to say, I'd like to try it out! I think @christine summed it up perfectly - yesterday's comments just go to show that we've got your message loud and clear, and we're living it and spreading it! Yes, I enjoyed yesterday's lively posts. Easy to see who's been following the UP for a while, and who didn't quite get the picture. Still, there's room for all. You've got my favourite shoes on today (my fave boots are your blue Laredos). and do we get another LBD friday/monday? Yes, yes, yes! Let's do LBD Friday this week! It's our last chance to get more people involved! Let's do it!! U.P team, can you help us with the announcement? This time, let's don the LBD and deck it up in a way you never would've done before. Yes! We should totally do that! And if you've got any of the UP accessories, use them too! Sheens, i've been away for a while, whoa you are still wacky as ever and i'm back on board for the last few days! Sheena is prepared for the volcano outbreak lasting longer...any air travel can be done by boat also...that's why she is already wearing her life jacket! Fab combo of color and form - a clean fav! reminds me of Lovelace from happy feet with his garland off of a 6 pack of tinnies. What a great outfit for my bday ! !Inspiring as always, excited to see what's in the pipeline ! Florescent pink doughnuts?!?! was my first reaction though. My red hat with black feathers just arrived from the auction! I do costumes for our local theater group and this hat will strut its stuff on stage in the near future. Thank you thank you for all the inspiration. I am sorry to say it, but your outfits do not look really good to me. I am not an expert, but I am italian, so I see pretty outfits everyday and everywhere. Your stuff would look awful on almost every girl. The point is that you are extremely attractive. You look so good you'd be gorgeous even dressed with a potato sack (as Marilyin did). I appreciate your effort though. And what you're doing is great. thank you for being so awesome!! you're journey has been very inspiring. Congratulations on your progress!! I'm excited to see where your journey will lead. You're doing a great thing!! Keep following your heart ;-) ?! count me in for a final LBD Friday! I agree with Sopreman. LOL! These outfits are outlandish. I don't think anyone would wear them unless doing a project like this, where the point is not dailywear but to take photos to post on a site for fans to view. @whatizthis: Maybe people don't wear anything "outlandish" where you live, but the actual world is much bigger than just your habitat, so you are mistaken to assume that there are people who don't exercise their creativity and dress outside the box. Handsome is as handsome does. In which case even that garbage bag makes a girl look pretty. she's wearing her heart, anyway. noa tagged this in. cred. ib. le. omigod this is incredible! incredible i tell you! the necklace looks like a snapshot of a beach sunset...incredible!! !